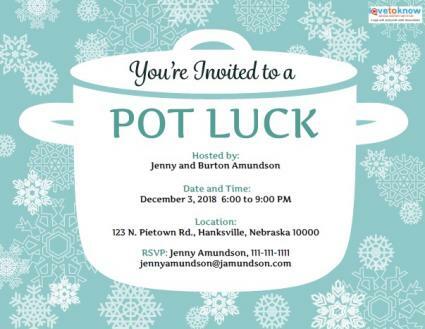 A good potluck invitation not only helps you spread the word about your party to all the people you want to invite, it can help you organize your party too. Download the following invitations for free or purchase customized invitations that suit your style, and start planning your get together. These festive invitations can be downloaded and customized to suit your needs. Just click on the image to open the file. Click on the text in order to add your own party info. Once you're sure all the wording is exactly the way you want it, click on the diskette button to save all your changes. When you're ready to print, just click on the printer icon. If you need help downloading the invitation, check out these helpful tips. If you'd like more options, take a look at the printable potluck invitations available from the following websites. Pottery Barn.com - Here you'll find a classy Thanksgiving potluck invitation that even has a spot to list what you want each guest to bring. Once you download the free PDF, you'll need Adobe Acrobat Reader to personalize your invitations, and Pottery Barn offers an option to download it for free in case you don't already have it. DIY Invitation Templates.com - This design is geared toward the holiday season, and the site offers a supply list and step-by-step instructions on how to customize and print the invitations. You can download for about $6. Etsy.com - Highlights of the printable invitations include a simple yet attractive design from MuchoGustoPrintables for around $6.50, and a cute pink and brown invitation from PolkaDotDesignShop that sells for about $15. Each seller offers instructions for customizing the files and printing them. Potluck Summer Picnic - The big slice of watermelon on this invitation makes this design a great choice for a picnic potluck. Pricing starts at just under $2 per invitation if you stick with the basic paper option, and prices increase if you prefer to go with one of the company's other paper options. Let's Dish - This invitation gets straight to the point with its Let's Eat theme, and the retro styling is also very attractive. Customizing options include selecting your font, envelope type, and even having your return address printed on the envelope. Pricing begins around $1.60 each for eight invitations, and the price per invitation drops if you order more. 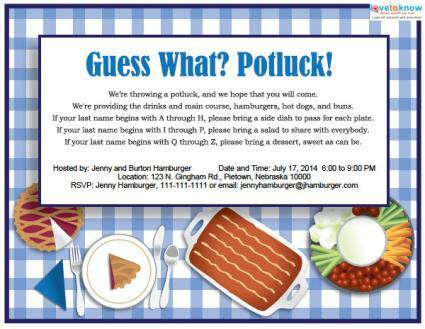 Potluck Party - This design features a potluck pot on a pink check background. You can choose from three different types of paper, and you even have the option of having your guests reply online. Pricing begins around $22 for a minimum 10 invitations. Holiday Potluck - White polka dots on a green background and a sprig of holly make this the perfect design for a Christmas potluck. You can customize all the wording, and paper options include basic, metallic, linen, and more. If you choose basic paper for your invitations, the price begins at just over $2 per invitation. Potlucks offer a fun way to throw a party without breaking the bank. As host, you'll probably want to provide the main course and then ask your guests to each bring a dish or beverages to help fill out the menu. When all is said and done, you'll wind up with a fabulous feast if you plan it right. Here are a few tips that will help keep your planning on track. Send out your invitations about three weeks before the date of your party. Set your RSVP deadline for one week before the party. Ideally, your invitation should give your guests some idea of what they should bring so you end up with a well-rounded meal. Keep track of which dish each guest intends to bring as the RSVPs begin coming in. That way you can politely suggest a guest brings something else if it seems like you're getting to many of the same dishes. 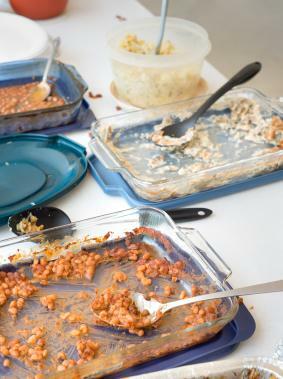 Although your invitations can help your party planning efforts, there's a reason why this type of party is called a potluck. In the end, you wind up with whatever dishes you're lucky enough to get, so relax and enjoy the dinner, as well as the company.